Awesome watch. Condition far exceeded expectations. Many thanks! Fast delivery. The refurbished watch looks like brand new except the white box. Alles tip top, gerne wieder! Uneingeschränkte Empfehlung! A beautiful watch, better than described, great price! A very responsive seller. Watch arrived in reasonable time given seller was on vacation. All you can ask. Five stars!! Had this watch for a few weeks now and love it!! Shipping was fast and watch is as was described. 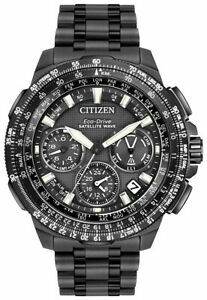 This is my fourth solar Citizen watch and another winner. I like especially the juxtaposition of the high tech inner workings of the watch and old school pilot slide rule bezel. Acquiring and setting the time is easy and fast. Hands and other functional displays are easy to read and adjust. Everything is pretty much intuitive and straight forward to operate on this watch (despite the thick manual that comes with it). The lumens/brightness of the hands and hour markers are OK but not great (same as on every other Citizen watch, but no comparison to Seiko). The titanium housing and band are much lighter than the stainless steel version. Haven't had it in water yet, so can't speak to how it'll hold up. It wears well, is the right size for my wrist and feels comfortable. Overall, I'm very happy with this watch, the look, feel, functionality, craftsmanship, materials used, bezel movement, GPS updates and solar energy source. This watch is sporty and elegant at the same time. I absolutely recommend this watch and would buy it again. Five stars from me. Great value, sophisticated profile, dressiest tool watch I own. Next to my Casio Rangeman, it is the watch I would want if it was the only watch I could have. Love the GPS timekeeping and the titanium case is not only non allergenic but supper light on the wrist. The lume quickly charges and lasts the night. Easily will be my daily go-to time piece. Now, if I could just learn to fly a fighter jet I’d feel like I’d made it. Really, I’ve bought refurbs before and have had really good luck and at the price I got this with warranty, I feel like I stole it. What attracted me to this watch: 1) The GPS accuracy 2) The black Military Styling. 3) The titanium construction 4) The light weight 5) the Saphire crystal 6) the overall functionality (I'm an engineer and gadget geek). Other comments: It is solar powered which I'm not necessarily a big fan of, but I'll just have to remeber not to store it in a drawer for long periods. I know some people love solar, I'm just not one of them. Also, the alarm beep is on soft side and the lum is "good" but not great. Lastly, when I had it sized, the pins that had to be removed then re-inserted would fall out easily and I had to have over-sized pins inserted. At this price point I'd have liked to have seen screws vice pins. At 47mm this watch is probably about as large as I could get away with on my 7-1/4" wrist, but it's fairly thin for such a complex watch so it works. I was a bit concerned with this being a "refurb" but at the price I paid compared to new I'm not complaining. You'd be hard pressed to tell this wasn't brand new from the dealer. Very light weight and comfortable. Large dial with fairly tall profile. Busy but sharp looking. Mine synced to local time in about 30 seconds but I did have to set DST (satellite doesn’t recognize). Time keeping is right on the atomic clock. Smaller 6 o’clock dial for your home time is in 24 hour format and hard to read initially but once you get the hang of it, no problem. Love the fact it runs by light - no winding or batteries. Settings can take a bit of reading to figure out. So far, I am very happy with this sharp watch.